Published on July 07, 2011. 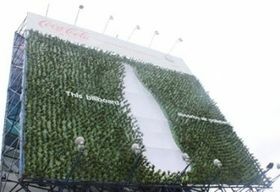 Trying a campaign that really is green, Coca-Cola and World Wide Fund for Nature Philippines have put up a billboard in Manila that they say helps to promote the environment: The 60-by -60-foot sign is made up largely of living plants, which absorb carbon dioxide. The billboard, planted on Manila's busiest street , was created by Momentum Philippines, collaborating with McCann Erickson Philippines and Starcom MediaVest Group. The billboard uses 3,600 pots of Fukien tea plants, which can each absorb an average of 13 pounds of carbon dioxide a year. Recycled Coca-Cola bottles were used as pots. The plants, which are potted in a mixture of industrial byproducts and organic fertilizers, are watered by an efficient drip irrigation system called trickle irrigation or micro-irrigation. 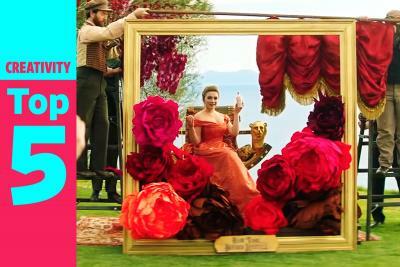 "We are proud that we have brought to life the first plant billboard in the country. It is an embodiment of our company's 'Live Positively' commitment to making a positive difference in the world by incorporating sustainability into everything that we do. With this, we hope to inspire Filipinos to join us in our journey, because we know that together, we can make a positive impact," said Guillermo Aponte, president of Coca-Cola Philippines, in announcing the effort.